Material delrin, SS screw, non floating line 2mm with Kevlar core. This is a custom designed high strength line with high abrasion resistance. The Kevlar core guarantees minimal stretch, essential for survey work. Select 200m/650feet or 120m/400feet reel. Includes a large-long double-eye stainless steel bolt snap. 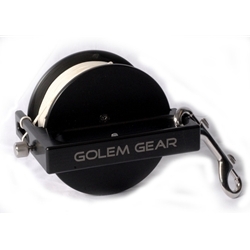 The Golem Exploration reel have an anti-fouling design with precision machined tolerances to ensure that line cannot slip between the spool and the handle. The side-mounted closed-end handle allows ambidextrous single-handed operation so that the reel may be held in the same hand with a Goodman light handle. Thumb screw is positioned to ride on the smooth outer rim of the spool allowing precise drag or complete lock down of the reel. Loosen the screw and start laying that line!